If you are a fan of pastel shades, then when winter hits, you should opt for pink. Different shades of pastel pink look very elegant. And to add that festive mood, you can always opt for sparkles. Night sky is perfectly beautiful during the wintertime. In case you would like those unknown galaxies to be closer, just depict them on your nails! Who said that polka dots designs are not festive-looking? Just look at these joyful white dots over a light brown base, don’t they make you feel like it is holidays already? Those of you who prefer staying strictly business even for holidays – matte black and gold is your perfect option. Unlike clothes, nail art can supplement the everyday look with accent and color. 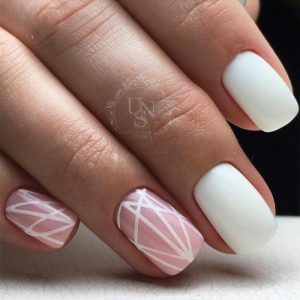 Try out these pretty winter nail designs if you opt for something trendy that can last for the whole week or even more.